Meanwhile I realized that these bourgeois upper-middle-class interiors were the spaces modernity declared war on, and yet this is the space that paintings come from and return to. Matvey Levenstein, L to R: “Cathedral,” 2009. Oil on linen, 50 x 67″. “Temple,” 2010. Oil on linen, 42 x 56″. Courtesy of the artist and Larissa Goldston Gallery. Photo by Brian Buckley. 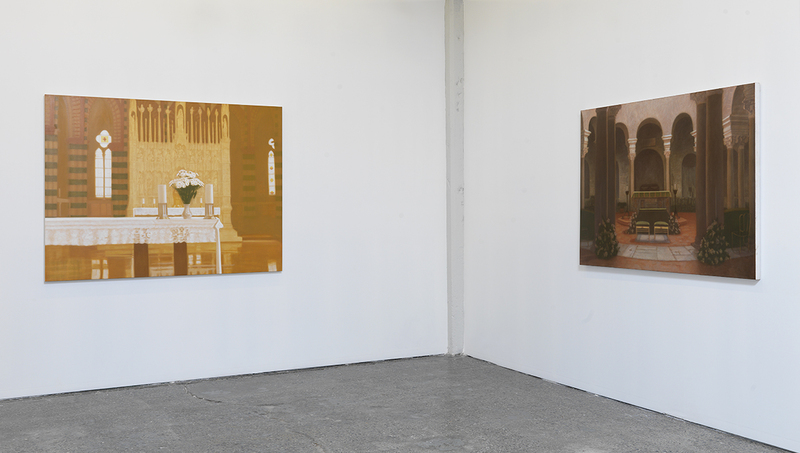 A painter of exquisite quiet where interiority seems to emanate from every brush stroke, Matvey Levenstein presents the interiors of religious buildings—here the church, the temple, and the cathedral—with a sense of temporality and sentiment far removed from the frantic pastiche of the cut and paste frenzy of the Internet age. In fact these spaces come from “no time” for time is not their métier, paint is. Painted from photographs taken on a trip to Italy, these interiors carry a flatness fused with atmosphere that evokes that very same piercing banality (because there is affect) of the architecture of bourgeois worship stripped of ideological effect. There is the groundedness of naïve sentiment in the way he paints, often associated with still lifes but here it burns these interiors into our hearts. Time stands still, like movie sets or holiday cards from years gone by, repackaged in subdued palettes of solid hues and simple light. In Church we are caught within the crowded artifice of crimson velvet chairs and gilded angels, set against the bouquets of flowers and cropped heads of statues that create the scene of worship as domestic space. Neither authentic nor kitsch but rooted in the fundamentals of painting “by moving backward you in fact can step ahead.” In this series, Levenstein wields painterly sentiment into a kind of Brechtean alienation effect.